The investiture of the Prince of Wales at Caernarfon Castle in 1911 was celebrated across Wales, but in Llandudno the three-day event was marred by tragedy. On the second day of festivities, one item on the programme was to be a floating beacon – an old fishing boat set ablaze in the bay at dusk. Two council workers, Thomas Jones and Joseph Hobson, had been working on the old boat all day. They had loaded it with timber, wooden crates, shavings and straw bales, and finally poured 40 gallons of naphtha (a flammable liquid) over it. They then towed it out into the bay and left it until the evening. At the arranged time, Thomas and Joseph rowed to the old boat to set it ablaze, but then there was a “terrific explosion”. The thousands of people watching from the promenade assumed it was part of the show. The first intimation of the tragedy arose when a party of ladies in a rowing boat heard cries for help and found Thomas Jones in the water. He had suffered severe injuries to his arms and face. He was taken to the cottage hospital but died, aged 60, of his wounds the following day. Local boatmen were alerted and scoured the area for Joseph Hobson, whose lifeless body was found by his father-in-law (coxswain of the town’s lifeboat) close to the burnt-out vessel. An inquest, two days later, concluded that the incident was a tragic accident. Mr Jones’ widow Ellen was awarded £222 9s 9d by the council in compensation. 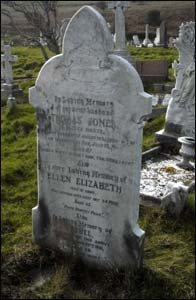 The Welsh inscription on his gravestone reads: “Morio ’rwyf o don i don, tua chartref” (“I sail from wave to wave, towards home”).